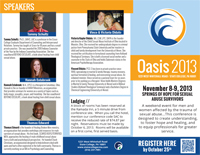 BMH authors Dr. Tammy Schultz and Hannah Estabrook are speaking Oasis 2013, a weekend event for men and women affected by the trauma of sexual abuse. 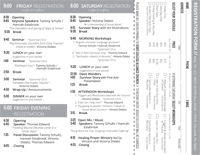 Held November 8-9, 2013 in State College, Pa., the conference will focus on Springs of Hope for Sexual Abuse Survivors. According to Dr. Schultz, this conference is designed to create understanding, to foster hope and healing, and to equip professionals for greater service. It is sponsored by the State College Alliance Church. Schultz and Estabrook are the authors of Beyond Desolate, the book that stresses hope versus hate in the rubble of sexual abuse. Click BrochureCOLOR (2) to download a complete copy of the brochure, which is pictured at right.